In late October, I take all the leaves off my roses, leaving just the canes. This puts them into dormancy. Then, I tie the canes together with twine. I mulch the roses about 10 inches with compost. I cut off just enough of the top part of the canes in order to fit them under the largest jumbo Styrofoam rose cone I can find at Hewitt's. I make an imprint of the bottom of the cone in the mulch. I do this because when it is time to put the cones on, the mulch will be frozen, and it is easier to put the cones in place if your have already made the impression in the mulch. Just before the snow falls, or the first ice storm is forecast, I run out and put the rose cones over the top of each of the roses, and put a couple of bricks on top so the cones don't blow away. (The rose cones should have two holes of about 3/4" on the top corners. This is so heat can escape if we have a warm day.) 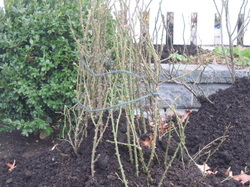 The coned roses stay covered like that until April, when I remove them. It is fun to peak into the little holes on top of the cones in the winter and see the green canes inside!